The Travelling Lindfields: Alaskan Cruises - Do Australians pay more than Americans? There is no doubt that Alaska is fascinating and beautiful, and when you live on the driest continent on earth all those glaciers are a serious drawcard, but is Alaska worth the cost and do Australians (and Europeans) pay more than North Americans for the privilege of being such loyal fans? Do Australians (and other non-North Americans) Pay More to Cruise to Alaska? About a year ago, while David and I were in the U.S, we decided to book a cruise to Alaska. David was in a generous mood and we picked out an expensive stateroom on a ship operated by one of the world's largest cruise lines. The cruise was scheduled to depart in mid-2015. According to the cruise line's U.S website, the cost for two of us would be US$7,971. We couldn't get our reservation to go through on-line so David rang the cruise line and tried to book by telephone. He was told that because we were Australians we had to book through an Australian agent, notwithstanding that we were physically in the U.S at the time, and wanted to pay in U.S dollars. We think the cruise line realised we were Australians because of David's e-mail address which has an 'au' suffix. Nothing David said would budge them. We either booked through Australia or we didn't go on the cruise. We had heard previously that Australians paid more than North Americans for the same cruises to Alaska and our inability to book the cruise in the U.S seemed to confirm this, so we took a screen shot of the cruise line's website with the details and price of the cruise. Two weeks later, back in Sydney, the same cabin on the same ship with the same date and place of departure was now A$10,650, an increase of 25%. Using the exchange rate at the time, which was a lot closer to parity than it is now, the cruise line wanted to charge us almost US$2,000 extra just because we were Australians. I don't know how you would feel, but for us the discovery of this price discrimination well and truly took the gloss off our Alaskan travel plans. We travel a lot and don't mind paying a reasonable price for the privilege. However, we were pretty sure we wouldn't be happy once we were on board and discovered that other passengers were paying US$2,000 less for exactly the same cabin on exactly the same ship just because they happened to be North Americans. Regional Price Discrimination Happens Worldwide. regional price discrimination based on a passenger's nationality is not exclusive to Alaskan cruises but extends to the other major destinations around the world. Short of using a VPN or TOR there was no way around the problem and even if we knew how to use a VPN and pretend to be Americans during the reservation process, there was the problem of what would happen when we turned up to board with our Australian passports. There are entire threads devoted to the issue of regional price discrimination on TripAdvisor and the consensus seems to be that while you could get around the price discrimination a few years ago by booking through certain travel agents the cruise lines have now moved, quite effectively, to shut that down. That was the end of our flash cabin on a flash cruise to Alaska. Life on a floating behemoth! Luckily, we found a Plan B: drive to Alaska using the Alaska Marine Highway. The Alaska Marine Highway is a series of car and passenger ferries which run from as far south as Bellingham, near Seattle, to Dutch Harbor in the Aleutian Islands on the far south-western tip of Alaska. The ferries call in at the same towns and ports as the cruise ships, many of which, including the capital Juneau, cannot be reached by road. The cabins are far from flash and you need to book early to avoid having to sleep on the deck but the overall experience is far more authentic than seeing Alaska aboard a floating behemoth. In the end, we were glad not to have been able to go on a cruise. If you would like to read about our experiences on board the Alaska Marine Highway click - here - and for all our posts on our Alaskan/Canadian road and car ferry trip click - here. True adventurers camping on board the MV Columbia - Alaska Marine Highway. We had a cabin. Have you been to Alaska? What did you think? Was it worth the cost? 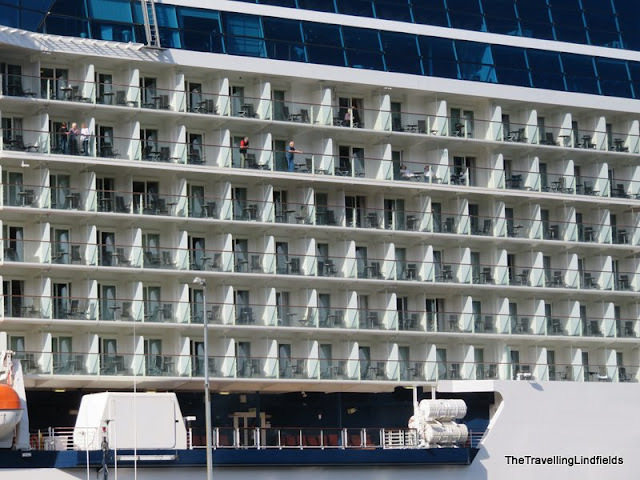 Did you pay more than the other passengers for exactly the cruise? 7 things you need to know before you visit Alaska. This is so outrageous, Lyn! I wan't aware that the price differences can be so high, but I always knew that some people pay more than others. At least when it comes to airfares. If I buy the same roundtrip from Europe the price is going to be about 25-30% less. I know there are some ways to trick the airlines as to what country you are from, but I didn't take the time to see if this works. David and I have a friend who lives in Singapore and he can get an airfare from Singapore to Sydney return at a lower price than we can go from Sydney to Singapore return. Australians often pay higher prices for the same products and I can tell you that we are well and truly sick of it. Even things like maps for our GPS are more expensive to download in Australia than if we buy and download exactly the same maps while we are in the US. There is absolutely nothing in my view which can justify that kind of price discrimination. Now I'm on my soapbox so I will stop typing - lol. That is so irritating. Aside from the added costs of having to get to the US or Canada to board the ship, all of that added cost just for being Australian... We went to Alaska and enjoyed our cruise, but I never thought to compare the price we paid with other passengers. It is very annoying. Unfortunately many Australians, and other nationalities, are unaware that they pay so much more for cruises than north-Americans. I have read some disappointed reviews when people discover that other passengers in the same standard of cabin pay thousands of dollars less. That's crazy! I've never heard that before!!! I'm hoping to go to Alaska next year, so I'll be on top of this now. As an Aussie Travel Agent I can assure you we are forced to pay more for almost every type of travel. It's certainly not the Agencies making the extra money! There used to be ways of tricking the system but most of these have closed now. It's not fair but nobody in high places seems to care, maybe because we pay for their travel anyway. Perhaps we should just boycott the rest of the world - lol. Can't see it happening somehow though. Lyn, I did not know anything about price discrimination on Alaskan cruises, but I agree. In the long run, you got the better deal...and experience! You are right. In the end we were really happy with the Alaska Marine Highway. It was a great experience and we met some wonderful people. I can't even get my head around the reasons for this or how this is at all fair if not illegal. Is there any way to get the cruise lines to try to explain the reasoning? I find it outrageous, and I'm American. I wrote an e-mail to the cruise line we tried to book with asking, politely, if there was any justification for their pricing policy. I didn't get a reply. I think the answer is that they charge what the market will bear and a determination has been made somewhere that Australians are used to paying more for things. As long as too many Australians (and Europeans) don't figure out that they are being charged so much more then the cruise lines can continue to do business this way. If they were doing it on the basis of ethnicity it might breach the various Racial Discrimination Acts in Australia but as it is I don't think it is illegal, just immoral. Oh! We were eyeing up an Alaskan cruise for this Autumn, but this makes me think twice about it. We're from the UK but I assume we'll pay more as well. My sister lives in Australia and she regularly pays 50% more for her SYD-LHR flights than I do for mine, which are exactly the same just reversed. I do feel sorry for her! P.S. did you know that cruise staff salaries are determined by their country of origin?! Which means two people doing the same job could be paid vastly different sums. It's all a bit shocking really isn't it? I didn't know about the cruise staff salary differences but I can't say it surprises me. The bad news is that as far as I could see UK residents booking these cruises also pay a lot more than US residents but it is not something I looked as specifically. I had no idea that cruise lines have this discriminating price policy. REally makes you wonder how they can get a way with this. Hah - I had no idea that people may camp on a ship, looks awesome. I am sure your trip was a lot better and more authentic than on the floating skyscraper. The camping on the ship just blew me away. It wasn't just back-packers but also families and older people. David and I had a cabin. I can't get him to go camping on dry land so camping on a ship was just never going to happen - lol. I have never heard of Americans paying more than Australians for something - now that is something I would love to see - lol! I was shocked and kept hoping that by the time I reached the end of your post, you would have a solution. No!!! (OK, you did, but not the one I wanted). I'm now wondering if Canadians have the same bad luck or if it's just North Americans. What a scam! So glad you found an alternative way to see Alaska! I thought Canadians were North Americans! I used the term to refer to both Americans and Canadians so if you are Canadian you are in luck - you get the lower prices too. It is the rest of the world who get charged more. I wish I had a solution but I don't - except maybe don't go on cruises but frankly it wouldn't surprise me if other kinds of tours had the same discrimination. I'm glad you brought this to our attention-what a discriminatory policy! I hope to travel in Alaska this summer and will definitely be looking out for this. Honestly, I think you were better off on the road trip than that big cruise ship anyway. Much more of a chance to discover off the beaten path and local treasures! In the end we loved the Alaska Marine Highway. It has its problems - like having to get up ridiculously early to catch the ferry to Sitka and then sitting in line for a couple of hours but it was such a great experience and we met so many locals it was worth it. It sounds as if the alternative way you chose to see Alaska is actually better. It's atrocious, this pricing discrimination, but everything happens for a reason and maybe by travelling the way you eventually did, you met more 'genuine' people and enjoyed the trip more? It'd be really interesting if the same applies to European based travellers (such as myself). The Trip Advisor reviews on Regional Price Discrimination suggest that Europeans get charged more too - sorry. I've heard of similar things happening to Americans who want to travel in Europe. But it's not just the air- and cruise lines. We've experienced discriminatory pricing all over. A .50 stick of satay in Bali costs $2 for a foreigner, and North Americans are charged higher admission prices in Central America. We've started to call it "being gringoed." I don't mind being charged more than the locals, it's being charged more than other tourists purely based on nationality that annoys me. When we were in Egypt many years ago we paid a lot more than local Egyptians to see the pyramids but I thought that was fair. If the locals had been charged the same as us then many of them would not have been able to afford to see their own monuments. We had the same thing happen at the Colesseum. I didn't mind so much that Italians got in cheaper but the cheaper prices applied to all EU residents so that non-EU residents were charged more - that annoyed us a bit. I have no quibble with charging locals less for entrances and things but it appears that Americans pay less for all cruises no matter where they go in the world. Wow I didn't know this but thank you for this useful information! My mom and I are Mexican I would have to research if the same applies! Mexico is pretty high up on our travel wishlist. I am even learning Spanish! One day I am sure we will get there. I don't know if the higher prices apply to Mexicans, maybe you might get lucky. The problem is that when you book a cruise from your home country it is very difficult to find out if you are being charged more because you always get directed to a website from you home country. That is pretty crazy. I wonder if it has something to do with the tipping aspect? But $2000 is way more than what would constitute for tips. I've never done an Alaskan cruise but have explored it via roadtrip. I think you got to see way more and do more than any cruiser would. I have heard it is because North-Americans spend a lot more on side-trips. Other nationalities tend to either organise their own or do less of them. The side-trips in Alaska are really expensive. The difference in pricing for flights seems to be fairly common but at least it is based on your country of departure and not your nationality. Imagine if you turned up to the airline ticket office and they asked for your passport then charged you according to your country of citizenship - essentially that is what the cruise lines are doing.